Marielle Killing: An Imminent Military Coup in Brazil? Military intervention in Rio has been considered by the Army and President Temer, a "laboratory to Brazil," has said the Army Commander responsible for the occupation. "The murder of Marielle intends to put the Brazilian left under the pressure of the fear," tells the Brazilian historian Vitor Schincariol to Global Research. 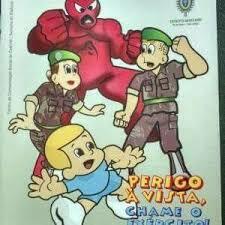 The magazines the military in Rio is giving to children since the first days of intervention, with a cover showing a red monster (the “red danger”) trying to attack a white and blond boy, protected by militaries, has everything to do with the assassination with four shots of the activist and councilwoman Marielle Franco (Socialism and Freedom Party) at 38 years old, on March 14 in the militarily occupied state of Rio de Janeiro. As well as jokes relating to the killing of the previously unknown politician in the rest of Brazil posted in the social network by Brazilian conservatives (including leaders), shortly after being substituted, little by little, by videos of Brazilian comedians, are not a surprise at all in the today’s Brazil. The ammunition of the weapon that was used in the crime, committed 30 days after the military occupation, came from the Federal Police (FP). The ammunition was acquired by FP in 2006, in a shipment purchased from the police teams of Brasilia. Probably, the criminals acquired, directly or indirectly, through corruption within the FP. 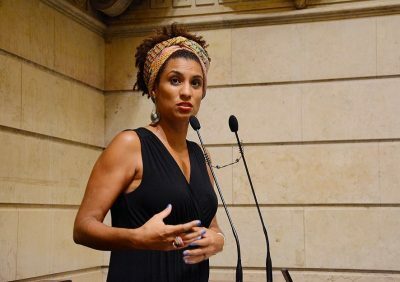 Four days before her execution, Marielle published in her social network a note repudiating the 41st Battalion of the Military Police of Rio de Janeiro, in which, according to her, police officers threw bodies of two young men into a river after committing the killings. The 41st Battalion of the Military Police is the most violent in the State and widely known in the neighborhoods and favelas (slums) of the Northern Zone as a den of bandits, abuses specialists, executions, and tortures of unarmed masses. Though the Brazilian mainstream media has shown Marielle as an activist for an abstract struggle after her death, a generic peace not putting into context her ethnic, political and class causes – the reasons why the black, socialist and favela resident militant was murdered – this crime has much to say about the frightening reality in Brazil. “The murder of Marielle intends to put the Brazilian left under the pressure of the fear,” tells Prof. Dr. Vitor Schincariol to Global Research. As she used to speak out about constant and grave crimes of public security organs against residents of the favelas – the vast majority blacks and poor – in the very city that the military claims to secure in these dark days, two weeks before being murdered Marielle had taken part in a commission to analyze President Michel Temer‘s military intervention in Rio. And she herself soon started denouncing abuses. Marielle was not stolen nor reacted to the attack, so a summary execution hypothesis is reinforced. At the same time, the Army Commander Eduardo Villas Bôas said in an official meeting on February 19, that the military intervening in Rio’s security need “guarantees” to avoid confronting “a new Truth Commission.” (Between 2012-2014, a Truth Commission was set up in Brazil to investigate the military crimes during the dictatorial regime, between 1964 and 1985). Prof. Dr. Schincariol explains to GR that the right wing forces are well aware of that, so they want to stop the popular organizations. “So, the mafias and the right wing forces, together with imperialist forces, are playing an increasingly dangerous game, which has as its logical effect the questioning of the traditional forms of democratic organizations by the very left, and their substitution for more radical ones,” he says. Data released on March 15, based on a study by the local press and official channels of the Military Police, shows that there were 149 murders in shootings last month, in the militarily occupied Rio, against 126 between January 15 and February 16 of this year. The shootings in the presence of a security officer represent 133 of the total number of this month. Between January and February, the number was 106. If in September 2017, 48% supported another military coup in the South American country, 74% of Brazilians now support the military intervention in Rio, which is “a laboratory to Brazil” according to General Braga Neto, who heads the intervention, clearly insinuating the intention to militarize the whole country again – – which is not a surprise taking into account the events, and the daily life in the country especially since 2013, when Brazil experienced its “Spring”. Brazil has been living a deep state of hate, especially against the poor people, blacks, and leftists, sentiment aggravated by the financial crisis. The sensation is that every road leads to another military intervention. All over the country, not few leftist militants and intellectuals are experiencing even an institutionalized persecution, from public sectors. In this 2015 video in a Catholic meeting in Brasilia to debate social justice and peace in Brazil, a bishop ended up strongly attacked, a too frightening hysteria is seen which perfectly depicts the today’s Brazil. On the other hand, to worsen the country’s situation “leftist” “teachers” and “lawyers”, recently advocating for freedom of speech, expelled and kicked colleagues and parents of students from a “debate” under the screams, “we defend democracy and free speech, so out of here!”.for not agreeing with their ideas. It has been common among “leftist” leaders in Brazil the call for extreme violence, since former President Rousseff impeachment; at the same time, any opposition to the far-right rise is totally paralyzed. There is no capacity of mobilization and reaction though since 2016 one hears the “left” proclaiming “we will take to the streets” not to permit impeachment, later not to permit President Temer’s reforms, later Lula’s condemnation and so on… But every reactionary measure has been passed without any resistance. As it has been more evident than ever that Brazil has never lived a real democracy, the South American nation is facing a declared ethnic, class and ideological war. As the Workers’ Party did not form citizens but only consumers, the nation is far from being prepared to engage itself in an effective fight against reactionary powers.